On October 27, 1962, the captain of a Soviet submarine ordered a torpedo with a ten-kiloton nuclear warhead to be launched at a U.S. aircraft carrier. One man's decision prevented that order from being carried out—and his story is a cautionary tale about what could still happen in today's world. An article published on the website of the Arms Control Association, describes the sequence of events that nearly led to nuclear war. During the Cuban Missile Crisis, a U.S. destroyer dropped depth charges to force a nuclear-armed Soviet submarine to surface, even though it was in international waters. The submarine had lost contact with Moscow days earlier and the captain—believing that all-out war had broken out between the U.S. and the Soviet Union—gave the orders to launch a nuke at the U.S. vessel. But, regulations dictated that the top three commanders had to agree before implementing the order—and one refused. 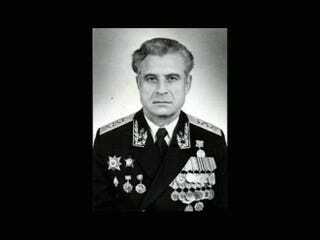 His name was Vasili Arkhipov (photo, top). While the United Kingdom, the United States, and France have well developed command and control systems in place that guard against accidental launch or the captain taking matters into their own hands, it is worth it, for the sake of global security, to question whether other nations who deploy or seek to deploy nuclear-armed submarines have such systems in place. In the case of both China (which does deploy nuclear-armed submarines), India (which plans to deploy such submarines), and Israel (which is rumored to be deploying such submarines), control of nuclear weapons is split between military and civilian control, with the military in charge of delivery vehicles and the civilian side in control of the warheads. In the case of land-based forces, warheads are only mated with the delivery vehicles in the case of a crisis. But with the introduction of submarines to the equation, such policy needs to be rethought, because in such scenarios such physical separation is not feasible. If one considers that due to the range and depth of the patrol of a nuclear-armed submarine a technological glitch is not out of the range of possibility, and that such submarines are beginning to cruse through very troubled waters, the probability for very alarming scenarios increases. It is imperative for the international community to think deeply about the implications of sea-based nuclear weapons and how the likelihood of accidental or unauthorized nuclear use rises with the number countries sending submarines on patrol beyond their national territories. In the sixty-odd years of nuclear history, humanity has been extremely lucky. But luck doesn't last forever.